When I was growing up, my dad did all of the cooking. My mom's contribution was to make a salad to go along with dinner every night. She meant well. Adding a side salad to your meal increases your fiber intake (most Americans don’t get enough), vitamins and antioxidants to your meal. But often these salads were the same three or four ingredients, along with a few different options of store bought dressing to chose from. It got pretty boring to be honest, (sorry, Mom), and I think that's why salads have a bad rep. Remember the episode of the Simpson's when Lisa becomes a vegetarian? Here, I'll refresh your memory. Poor Lisa, I can relate. A bowl of veggies usually just isn't as popular as other more flavorful (but probably unhealthy) food. Most people think having a salad as a meal won't be filling enough, worry they won't feel satisfied, and they just want something heartier and more, well, interesting. If you go to a restaurant, the solution to this is to add a protein, usually meat or fish, occasionally tofu at the more vegetarian friendly places. And while that's always an option to help your salads be more filling, there's so much more we can do to actually get us excited about having all those veggies we know we should be eating! 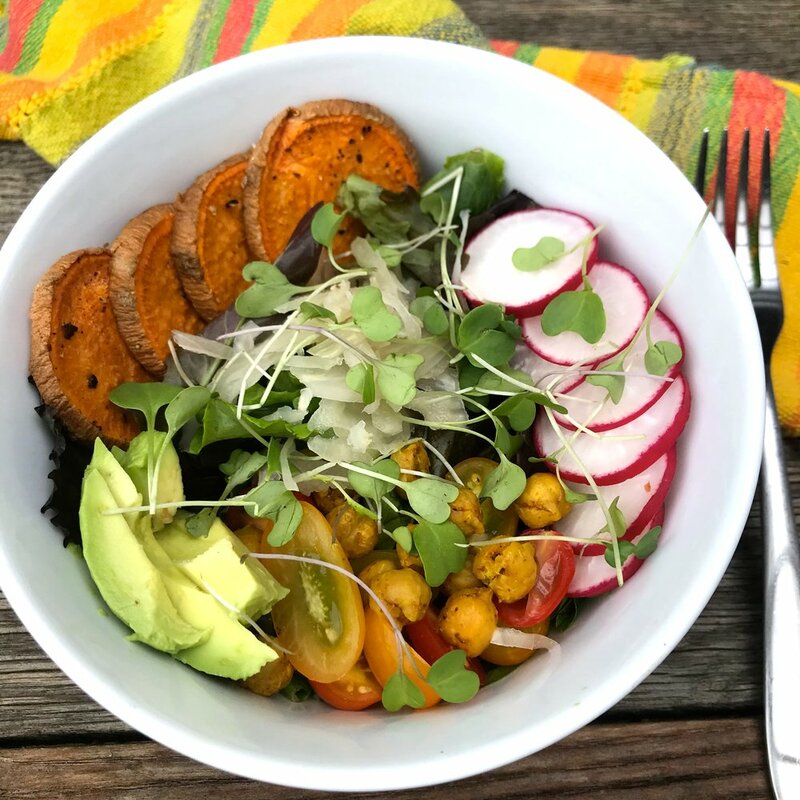 Whether your goal is to eat more vegetables, bring your own lunches to school or work, cut down on processed food or just get out of your food rut, this post is for you. I want you on Team Salad! For people who don’t like to cook or don’t have a lot of time, salads are the quickest and easiest way to get more servings of veggies into their day. My hope is that by mixing it up a bit and adding more variety, you'll not only boost the nutrients in your diet, but also get inspired to play a bit in the kitchen, and actually be happy to eat a salad. Let's prove Homer Simpson wrong, shall we? 20 ingredients to help jazz up your salads, make them more satisfying, and maybe even win some friends. Change up your greens, adding massaged kale, arugula, or spinach instead of using only lettuce. Falafel : homemade, or I like the frozen ones from Eat Gud. Veggie patty : homemade, or with quality ingredients like Hilary's Eat Well. Never make a boring salad again. Now, let's talk dressing. I think we all know that if we're trying to be healthy by eating a salad, but then drown it in Ranch dressing, it pretty much defeats the purpose. My go-to homemade dressing are a simple vinaigrette and a tahini dressing. Both are simple and delicious, and taste good on a variety of salads. Make a batch and store for a week in the fridge, so they're ready to go when you need them. If you've got some other favorite salad fixings, I'd love to hear! And as always, if you're curious about specific foods that might help support your personal health, please send me a message and let's talk! Ok, one last time. It’s just so catchy.